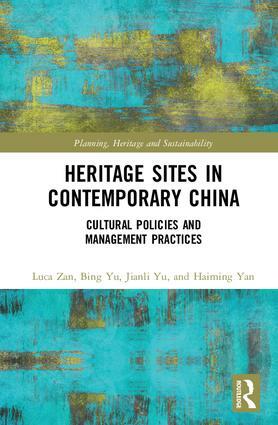 Heritage Sites in Contemporary China: Cultural Policies and Management Practices focuses on cultural heritage policies in China emerging in the period of the 11th and 12th Five Year Plans. Various important Chinese sites across China are investigated, including Luoyang Sui, Daming Gong, Niuheliang, Xinjiang, and Nanyuewang through the dual perspective of archaeological debate and as a case study of policy making. It explores the relationship between policy and the institutional and administrative conditions, such as budgeting and land concerns, which affect it. Building on the research project implemented by the China Academy for Cultural Heritage (CACH) from 2012–2014, which focused on the impact of the Dayizhi Policy for Great Archaeological Sites, the book provides an interdisciplinary insider’s approach to viewing archaeological discoveries; policies and emerging practices in site and archaeological management; and public administration in China. Featuring contributions from experts within CACH and from the Chinese community of archaeologists, and including numerous tables, data and maps, it will appeal to researchers and scholars in disciplines such as archaeology, heritage management, public administration, and policy making. 3.5. The dayizhi policy evolution: from conservation to "conservational interpretation"
Chapter 4. A three-level discussion on the dayizhi policy: toward unanticipated consequences? 6.7. Dayizhi conservation policy at S&T: lost in translation? Luca Zan is Professor of Arts Management at the University of Bologna, Italy; Adjunct Faculty at Carnegie Mellon University, USA; and Central Academy of Fine Arts, Beijing. His current research focuses on international comparisons in managing arts and heritage organizations. Bing Yu holds Masters degrees in Engineering and Business Administration. She is currently a Research Fellow and Deputy of the Institute for Heritage Studies, CACH, Beijing. Jianli Yu holds Masters degrees in Archaeology and Science. He is an Associate Research Fellow at the Institute for Heritage Studies, CACH, Beijing. Haiming Yan holds a PhD in Sociology and is currently an Associate Research Fellow at the China World Cultural Heritage Center, CACH, Beijing. The speed of growth of Global South’s emerging countries has quickly imposed, in recent years, new priorities in the urban agenda of this part of the world. In particular, the controversial relationship between the loss of local/regional identity and the modernisation is increasingly becoming a matter of great concern especially in Asia, Africa and Latin America. In these contexts the modernisation implies an unprecedented wave of urbanisation that is seriously threatening, in some cases, the survival as such of the traces of the past, especially the urban or rural heritage, or broadly speaking, the tangible and intangible dimensions of local cultures. Notwithstanding that western countries are facing similar disruptive forces the Global South requires different analytical frameworks and approaches to sustainability. Historic Urban Landscape, theory and applications. If you would like to submit a proposal, please contact the series editors, Giulio Verdini (G.Verdini@westminster.ac.uk) or Paolo Ceccarelli (cec@unife.it), or the commissioning editor, Grace Harrison (Grace.Harrison@tandf.co.uk).